A woman caught on a Disneyland camera sprinkling a powdery substance a week ago from the Pirates of the Caribbean attraction was enough to close the popular pirate ride for 45 minutes. The woman, interviewed and released by Disneyland employees, claimed that she was dumping baby powder from her ride car, but a blogger who writes exclusively about Disney reported that the instance actually may have been the latest example of a guest scattering the remains of a loved one from a park attraction. "The craze seems to have gotten its start at the Haunted Mansion, " blogger Al Lutz wrote on his Web site miceage.com, "with the earliest incident taking place in the late 1990s. Ever since, the practice has become more popular by the year." Lutz, in fact, claimed the practice of scattering ashes has become so common that the ride attendants have been briefed on how to handle such incidents and custodial crews are using specially equipped vacuums to collect the ashes. He cited an instance last month in which a staff member at the Haunted Mansion found several piles of ashes alongside the ride track that were ultimately identified as human remains. But Sgt. Rick Martinez, a spokesman for the Anaheim police department, told ABC News that while a police officer who works inside the park was notified about the possibility of human remains scattered inside the 15-minute flume-style pirate ride last Friday, there was no confirmation that the ashes actually were those of a deceased person. "As soon as the woman gets off the ride, she says it was baby powder, " Martinez said. "And that lady's in the wind." Park security and ride staff could not recover any of the powder, which quickly dissipated in the ride's water. "Bottom line, we did not respond, " Martinez said. "We were there, but there was really nothing to go on. We did not take a report." 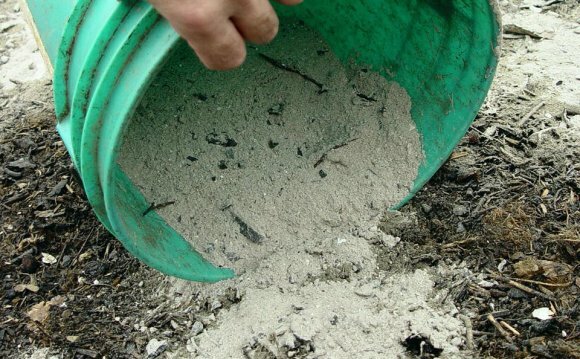 Martinez acknowledged urban legends about the crematory droppings, but said that in his 35 years on the force, no one's ever been caught for dumping a loved one's ashes on the grounds of the Disneyland amusement park. Still, Lutz, the Disney blogger, speculated that other attractions are not immune. "It's a Small World is another long, 15-minute ride that doesn't have a single security camera anywhere, " Lutz wrote. "All sorts of illicit things happen inside Small World at the end of the night, and leaving grandma's remains in there to listen to that catchy song for all eternity is definitely a possibility." Rob Doughty, a Disneyland spokesman, reiterated that there's no evidence the woman was actually dumping human remains and shot down Lutz's assertion that this is part of a growing trend. "The problem I have with blogs is they don't necessarily have to have validated information, " Doughty told ABC News. ABC News is a subsidiary of the Walt Disney Company. Like Martinez, Doughty admitted that there are myths about illegal Disneyland cremation ceremonies, but said the park has never had a confirmed case where human ashes were found. In fact, he said, his department receives, on average, two requests a year from guests eager to spread a loved one's ashes on the grounds of the park. "Clearly this is a special place, " Doughty said. "There's a great deal of emotional connection to Disneyland." Guests responded with mixed opinions on the possibility of human remains being left by loved ones around the iconic amusement park. "I've just heard people joke about it, how much they love Disneyland and that they'd like to be buried there, have their ashes scattered there. I've even said it, " Penny Atwood, a Disneyland visitor, told ABC News' Los Angeles affiliate KABC. Creative cremation methods have become a popular business as the number of deceased Americans who choose to have their remains incinerated as an alternative to traditional burials skyrockets. In 1975, according to the Cremation Association of North America, just under 124, 000 - or about 6 percent - of dead Americans were cremated. That number grew to 32 percent in 2005, with nearly 785, 000 cremations, and is expected to surpass 50 percent by 2025. And no longer are people always content with keeping ashes packed in an urn on the mantel or even sprinkling them out at sea. Celestis, a Texas-based company, offers to launch ashes into space. "Leaving Earth to touch the cosmos is an experience few have ever known, but many have often dreamed of, " the company says on its Web site. "Space Services makes it possible to honor the dream and memory of your departed loved one by launching a symbolic portion of cremated remains into Earth orbit, onto the lunar surface or into deep space." Another novel cremation opportunity is offered by Eternal Reefs Inc., a Georgia company that will mix human remains into a concrete-type substance used to create artificial reefs. In August 2006, three people were kicked out of Angel Stadium, very close to Disneyland, after trying to scatter a loved one's remains on the pitcher's mound.